Straightening curly hair can look wonderful if you do it right. However, not all flat irons are created equal. There are some flat irons that are designed to straighten but are cheap and will damage the hair. If you use a cheap and unprofessional iron it can wreck your hair and permanently damage it. If you want to do your hair right you should use a professional iron that makes your hair look great. SHE by SO.CAP.USA flat irons have the professional touch that you need to make your tresses look beautiful and pin straight. 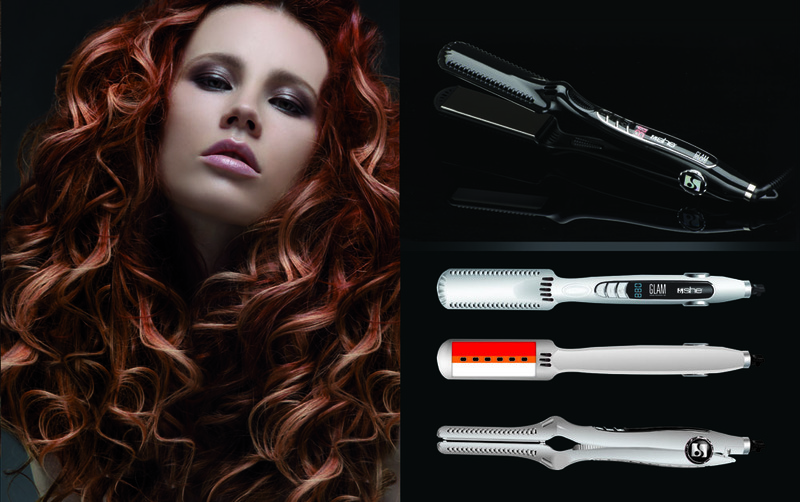 Not only will these irons not damage your hair but will actually improve the health, vitality and look of the hair. This iron can be the difference between damaged and brittle hair and smooth, shiny hair that is full of life. SHE by SO.CAP.USA flat irons makes several different hair irons including the SHE by SO.CAP.USA Glam Flat Iron, the SHE by SO.CAP.USA Pearl Hair Iron, the SHE by SO.CAP.USA Pure Power Flat Iron, the SHE by SO.CAP.USA White Devil Flat Iron, the SHE by SO.CAP.USA Velvet Black Flat Iron and the SHE by SO.CAP.USA Velvet Flat Hair Iron. All of these hair irons have slightly different properties. All of the SHE by SO.CAP.USA flat irons are enhanced with special properties to protect and even improve the health of the hair. The She Glam Flat Iron straightens, dries the hair and has the ability to create curls and waves for a dimensional look. This iron is idea for quick straightening and it smooths out frizzy ends on the hair as well. The SHE by SO.CAP.USA Pearl Hair Iron also straightens, dries and creates curls and waves. The curls and waves that can be created with the She Pearl are tighter and smaller than the looser and larger curls that can be created with the SHE by SO.CAP.USA Glam Flat Iron. 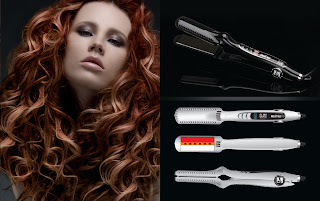 The SHE by SO.CAP.USA Pure Power Flat Iron is known for it's ceramic design and is generally the same design as the SHE by SO.CAP.USA Glam except that it is infrared and has a tourmaline base. The SHE by SO.CAP.USA White Devil Flat Iron is an especially good iron for improving the appearance of hair. The SHE by SO.CAP.USA White Devil Flat Iron is the most advanced of the irons and therefore is a great iron for the professional hair dresser. Not only does the SHE by SO.CAP.USA White Devil Flat Iron straighten the hair but it helps any hair product applied to the hair to penetrate deeper into the hair allowing the product to work better than if it were just applied to the hair. This iron improves the elasticity of the hair and repairs damage to the hair leaving it shiny, strong and resilient. The SHE by SO.CAP.USA Velvet Flat Iron is the largest of all of the irons making it the ideal iron for straightening hair of long lengths. The SHE by SO.CAP.USA Velvet Gold Flat Iron is made of ceramic and tourmaline infrared and the SHE by SO.CAP.USA Velvet Flat Iron curls as well as straightens and repairs damaged hair. Regardless of which flat iron you choose, if you choose one has the SHE by SO.CAP.USA logo, you are getting a premium flat iron that has professional quality and years of use in it. Hair extensions are a great way to add length and even body to your hair. There are all different types of hair extension varieties that suit different hair types and textures. From synthetic to human hair, extensions all need to be cared for no matter how long they have been clipped to the hair. If you are thinking about getting hair extensions, you will need to know the different types that are available. Adhesive hair extensions are glued onto your scalp right next to the beginning of your real hair shaft. You may purchase them on your own or go to a salon and ask for them. Most adhesive hair extensions have a clear drying glue that is not visible and are simple to peel on and off again. The glue used for these extensions form a secure bond, so you don’t have to worry about them becoming loose over time. The popular glue used for these types of extensions is keratin glue, because of the healthy effect it has on the hair. Clip in hair extensions are the easiest to use. This is because you can do it on your own accord without the help of others and they snap right into your hair. There are many forms of clip in hair extensions in either synthetic or real human hair. Clip in bangs are a popular trend that will give you a new hairstyle. The most common type of clip ins are long panels which are used to give the hair more volume and body. Hair extensions that are bonded are a bit more difficult and are meant to be used for a longer period of time. Bonded hair extensions have formulated hair adhesives that are meant to be glued onto your scalp. These extensions can be worn for half a year before getting new ones to replace them. They are meant to not only add length to the hair, but create a full body of hair as well. The only downfall to bonded hair extensions is that they may weigh the head down and cause headaches. SHE by SO.CAP.USA Hair Extensions are meant to be glued at the base of the head rather than at the crown. They are meant to provide length to the rest of the hair and are all made out of real human hair. So.Cap hair extensions are made with keratin enriched bonding glue to keep the rest of your hair healthy. They come in a wide assortment of hair colors and can be applied at home or by a hair professional. All types of hair extensions will give you the same effect that you want. Keep in mind that some types of extensions are more difficult to apply than others. In the retail world, almost all products are available as cheap items that are not made well with poor quality materials. Alternatively, other companies often create the same product, costing more but with higher quality materials and better results. This is true of anything from purses to sweaters and beauty products like hair extensions. A little research, however, can help find the best hair extensions around. Considered by many to be one of the best types of hair extensions, so.cap hair extensions use technology and science to create high quality hair extensions that attach securely. Created from 100 percent human hair that has not been processed or covered in silicone, the hair extensions are attached using ultrasound technology and cold fusion. The machine emits an electrical signal that softens the keratin of the natural hair during attachment. SHE by SO.CAP.USA Hair Extensions come in over 80 different colors and curly, straight or wavy styles. Bonded hair extensions usually come in strands of hair that attach using adhesives to the natural hair in small sections. This is one of the best types of hair extensions around because a professional, ensuring a better application and longer-lasting results (usually between four and six months), performs the process. Ask a professional stylist about other hair extension bonding techniques. Some hair extensions attach using a variety of different types of adhesive, applied to connect the hair extensions to the natural hair. The adhesive material for adhesive hair extensions is either wax or keratin-based and usually lasts between three and six months. Different types of adhesive hair extension materials include thermal bonding, which attaches strand extensions with a wax-based material, or liquid bonding, which is keratin-based and usually lasts less long than wax-based adhesives. For those seeking a shorter-term experience, clip in hair extensions are some of the best kinds of hair extensions around. These pieces of hair can be professionally attached and left in for a long time or removed after just a few hours. Some extensions are natural hair and other types are synthetic and come in various colors and styles. With more than 90 colors to choose from, SHE by SO.CAP.USA Hair Extensions is considered a premier brand that has the quality so many women desire. Clip in hair extensions may temporarily add highlights or longer hair without needing to create the look naturally. Contact a professional hair stylist to determine the best hair extensions around and which ones work best for individual styles, hair types and preferences.